BRIDGEWATER, N.J., April 10, 2019 /PRNewswire/ -- Starting in June, Sanofi will further expand its innovative Insulins Valyou Savings Program so people living with diabetes in the United States can pay $99 to access their Sanofi insulins* with a valid prescription, for up to 10 boxes of pens and/or 10 mL vials per month. The expansion of this program helps to address the challenge too many patients face regarding unpredictable and unaffordable pricing for their insulin. "It is unacceptable to Sanofi that some people living with diabetes are struggling to pay for their insulin, so we have moved to act creatively and aggressively to help address affordability and access needs," said Michelle Carnahan, Head of North America Primary Care at Sanofi. "By giving those who require both long-acting and/or mealtime insulins or use more than one box of pens or one vial per month access to their insulins for one flat price, we aim to help limit the burden on the individuals who have high out-of-pocket costs at the pharmacy counter." People exposed to high out-of-pocket prices at the pharmacy counter can participate in the Insulins Valyou Savings Program regardless of income level. This includes those who are paying high retail prices for their insulin and those who don't qualify for other patient assistance programs. Kelly L. Close, co-founder, The diaTribe Foundation, and president, Close Concerns, said, "Sanofi is taking this vital, transformational action to make its insulins more affordable through this program. The U.S. diabetes community is in the middle of a crisis, because our dysfunctional healthcare system doesn't allow equal, affordable, access to insulin. As patient advocates at diaTribe, we have been strongly urging manufacturers, insurers, healthcare providers, pharmacy benefit managers – and the government – to work together to help alleviate this problem. Today, we recognize Sanofi for their outstanding leadership in order to make their insulins available at a better price for all, regardless of income or dosing needs." "As premiums on insurance plans continue to climb, some people living with diabetes have had to exit the higher premiums so they can find ways to pay less. The result may be the loss of prescription benefits," said Lon Chenowith, who has been living with diabetes for more than 30 years. "That was what I was forced to do last year. Sanofi has savings programs for people who have been prescribed their insulin that can help them save on prescription costs. They have been a big encouragement to people like me." Sanofi continues to offer other resources to make insulins more accessible including co-pay cards which may limit out-of-pocket expenses sometimes to $0 for all commercially insured patients regardless of income level. In addition, Sanofi offers assistance programs that provide medications, including insulin, at no charge for qualified low-income, uninsured patients through the patient assistance component of the Sanofi Patient Connection program. Together, these programs demonstrate the company's dedication to finding support to help people living with diabetes gain access to the insulins they need. 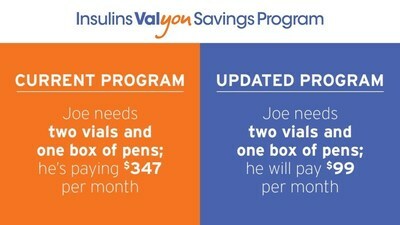 * The Insulins Valyou Savings Program does not include Sanofi's combination insulin product. This press release contains forward-looking statements as defined in the Private Securities Litigation Reform Act of 1995, as amended. Forward-looking statements are statements that are not historical facts. These statements include projections and estimates and their underlying assumptions, statements regarding plans, objectives, intentions and expectations with respect to future financial results, events, operations, services, product development and potential, and statements regarding future performance. Forward-looking statements are generally identified by the words "expects", "anticipates", "believes", "intends", "estimates", "plans" and similar expressions. Although Sanofi's management believes that the expectations reflected in such forward-looking statements are reasonable, investors are cautioned that forward-looking information and statements are subject to various risks and uncertainties, many of which are difficult to predict and generally beyond the control of Sanofi, that could cause actual results and developments to differ materially from those expressed in, or implied or projected by, the forward-looking information and statements. These risks and uncertainties include among other things, the uncertainties inherent in research and development, future clinical data and analysis, including post marketing, decisions by regulatory authorities, such as the FDA or the EMA, regarding whether and when to approve any drug, device or biological application that may be filed for any such product candidates as well as their decisions regarding labelling and other matters that could affect the availability or commercial potential of such product candidates, the absence of guarantee that the product candidates if approved will be commercially successful, the future approval and commercial success of therapeutic alternatives, Sanofi's ability to benefit from external growth opportunities, to complete related transactions and/or obtain regulatory clearances, risks associated with intellectual property and any related pending or future litigation and the ultimate outcome of such litigation, trends in exchange rates and prevailing interest rates, volatile economic conditions, the impact of cost containment initiatives and subsequent changes thereto, the average number of shares outstanding as well as those discussed or identified in the public filings with the SEC and the AMF made by Sanofi, including those listed under "Risk Factors" and "Cautionary Statement Regarding Forward-Looking Statements" in Sanofi's annual report on Form 20-F for the year ended December 31, 2018. Other than as required by applicable law, Sanofi does not undertake any obligation to update or revise any forward-looking information or statements.